The change is an attempt to streamline the company’s top-level decision-making process, the company said on Thursday, when it reported its 2010 fourth-quarter earnings. On a conference call, Schmidt said in his new job he will focus more on external issues, working with customers, partners and government. Page praised Schmidt’s leadership over nearly a decade and said his advice as executive chairman will be invaluable. Google generated US$8.44 billion in revenue in the quarter, ended Dec. 31, 2010, up 26 percent compared with 2009’s fourth quarter. Subtracting commissions paid to partners and other fees, revenue came in at $6.37 billion, beating the consensus estimate of $6.06 billion from analysts polled by Thomson Financial. Net income came in at $2.54 billion, or $7.81 per share, up from $1.97 billion, or $6.13 per share, in the fourth quarter of 2009. On a pro forma basis, which excludes certain items, net income was $2.85 billion, or $8.75 per share, beating the analyst consensus estimate of $8.09 per share and compared to $2.19 billion, or $6.79 per share, in the fourth quarter of 2009. In a statement, Schmidt called the fourth quarter “a terrific end to a stellar year” and credited the success on a strong core search advertising business and to the momentum in emerging businesses such as display advertising and mobile. “There is no other CEO in the world that could have kept such headstrong founders so deeply involved and still run the business so brilliantly,” Page said in the statement. Schmidt said this change has been under discussion “for a long time” as the company tries to “simplify” its management structure. “By clarifying our individual roles we’ll create clearer responsibility and accountability at the top of the company. In my clear opinion, Larry is ready to lead and I’m excited about working with both him and Sergey for a long time to come,” he said in the statement. Schmidt said the key to good relations with regulators has been communicating and countering misunderstandings about what Google does and does not do. “We’re trying to be as transparent and as collaborative as possible,” Schmidt said. “We try to stay well within the safety zone of the way we’re operating with respect to the legal issues and the competitive issues. We also argue very strongly that the things that we’re doing are very pro-competitive, and I genuinely believe that,” he said. Google’s other co-founder, Sergey Brin, will oversee strategic projects. Brin said he wants to focus more on his personal passions, including several “significant” new products. He said he would talk more about those products in the future, saying Google had recently been accused of announcing “vaporware” for discussing new products too vaguely. 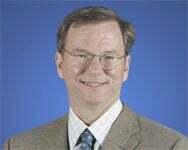 Schmidt became Google’s CEO in 2001, steering the company through its massive financial growth, including its IPO, as well as through a significant expansion of its technology and business focus beyond its core search engine market. Updated at 4:22 p.m. PT with more information from a Thursday conference call.